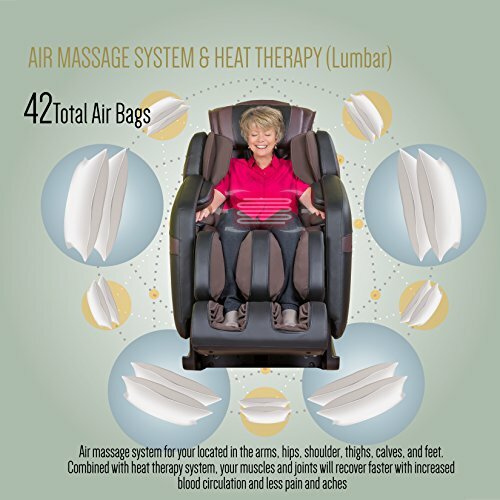 Tons of features, such as massage rollers, heating pads, and adjustable leg rests. This recliner chair truly is one of a kind. 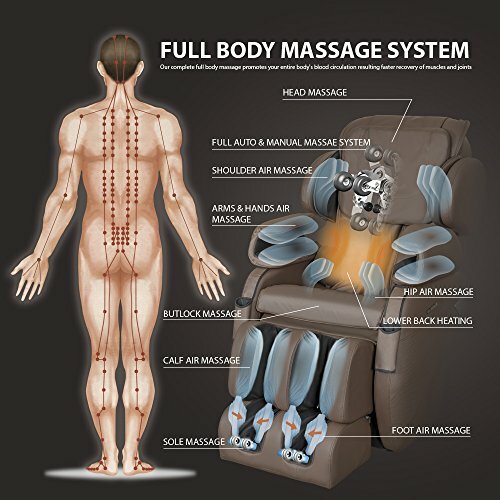 It features dual rollers that massage the user’s body from the upper back all the way down to the glutes. This is especially beneficial for people who suffer from back pain, sciatica, and sore glute muscles. This massage provides a stretching function compatible that allows for spinal decompression. It also has foot rollers. The rollers are designed to feel like a deep tissue massage provided by human hands. 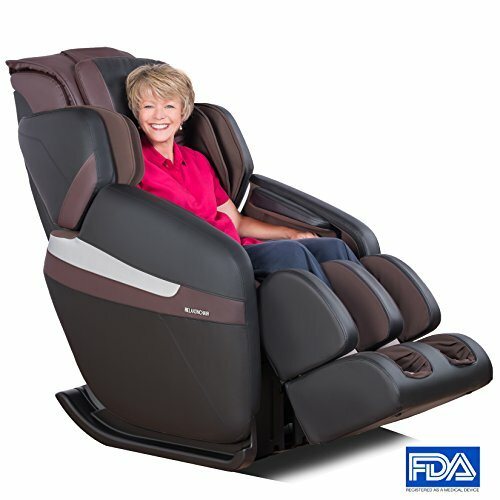 The chair provides 4 automatic massage settings which slowly stretch outs tight and sore muscles. 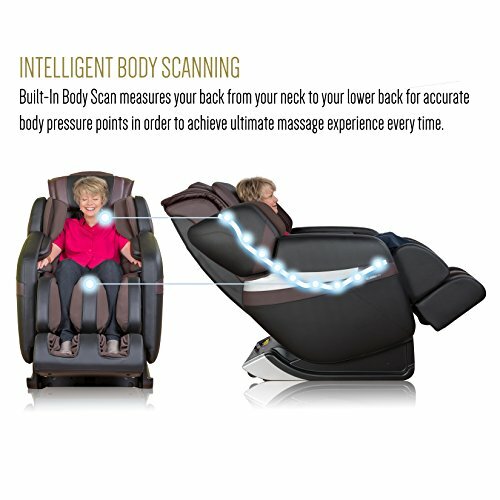 It also features built-in sensors that automatically detect your height in order to determine the length of your spine, ensuring a fully customized massage experience. It’s like having a massage therapist in your own home! 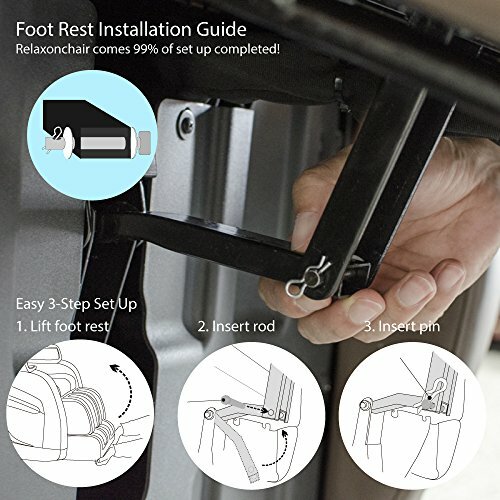 The RELAXONCHAIR is built with top-quality materials that rival those of its more expensive counterparts. Each chair is made from synthetic leather and comes with a remote control which the user can control using only one hand. 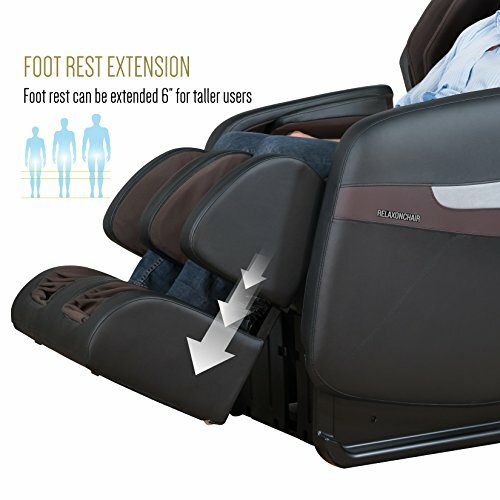 The leg rests can be placed at different angles in order to relieve stress on your heart and muscles. 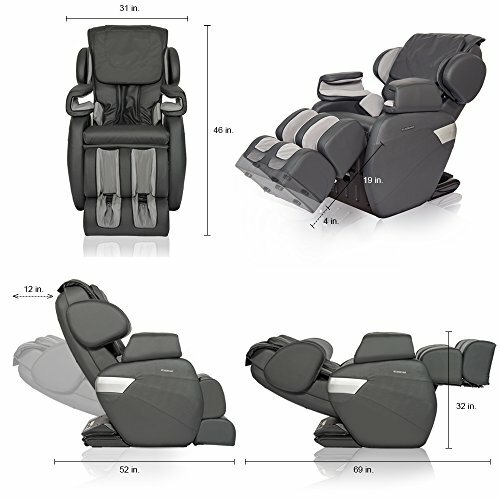 Airbags located throughout the chair can provide acupressure to different parts of your body. 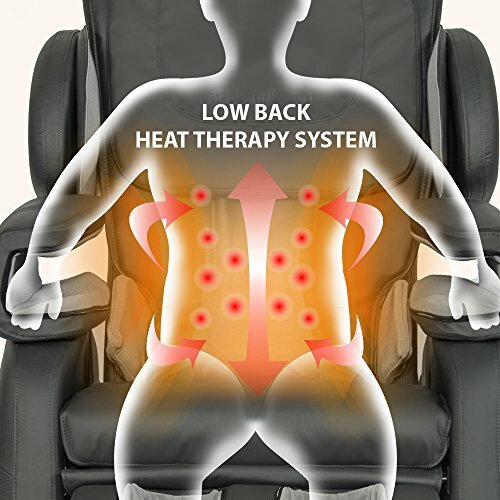 The chair also comes equipped with lumbar heating pads that will relieve aching muscles. 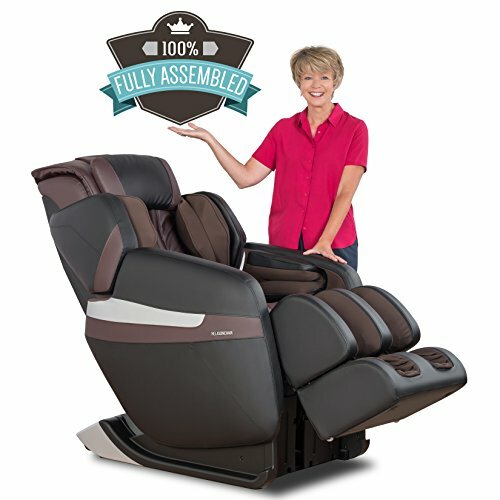 This recliner chair comes fully assembled, and buyers only have to install a few pieces at home. Reviews for this recliner chair are overwhelmingly positive. Most reviewers agree that this chair is just as good as many of its pricier competitors. Many have praised the chairs’ sturdy yet comfortable construction and how easy it is to install it once it gets to your home. 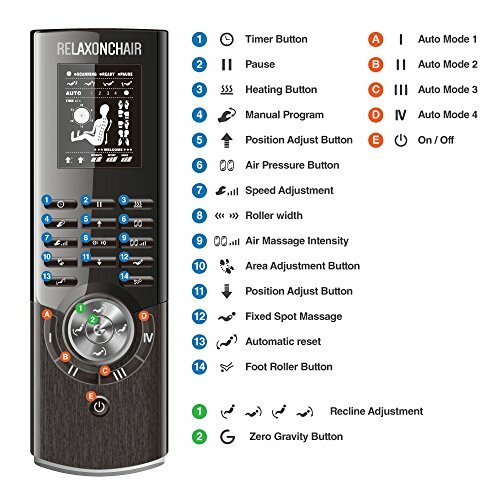 Several reviews highlight the fact that the chair’s massage feature has improved their chronic hip and back pain, and that the chair can support a lot of weight. Many even choose to sleep in it! 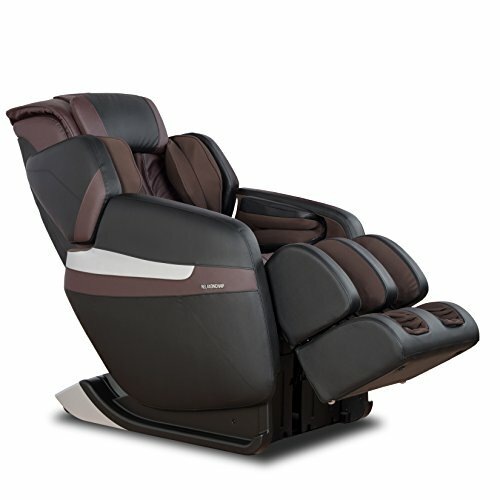 It is a pricey investment; however, it is still cheaper than most other massage chairs in the market. The massage feature might be too intense for some people. If this is the case, you can add extra padding to absorb some of the impact. 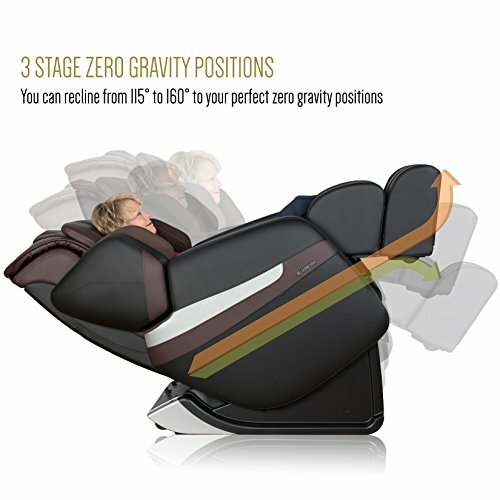 THREE STAGE ULTRA AUTOMATIC ZERO GRAVITY MULTI-FUNCTION MASSAGE CHAIR: Zero gravity chairs elevate your feet to the same level as your heart, minimizing the strain of gravity on your vertebrae, relieving the discomfort of back pain. Your heart can work less and you can relax more. QUALITY & INNOVATION: From top quality soft grained synthetic leather to enhance your experience to light total weight for easy mobility, the chair is thoughtfully designed with user friendliness in mind. 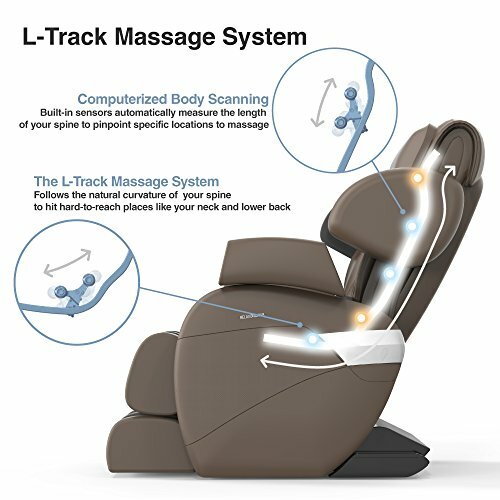 BUTTLOCK L-TRACKING MASSAGE SYSTEM: The rollers glide from the upper back all the way down under the seat. This new rolling system provides a full body massage. COMPUTERIZED BODY SCANNING: Built-in sensor automatically measure the length of spine and knows where to massage. 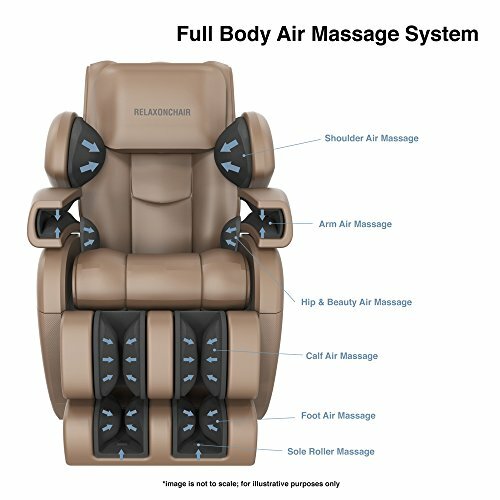 AIRBAG MASSAGE TECHNOLOGY: Uniquely designed airbags are programmed to inflate/deflate separately which causes the body to twist and stretch on shoulders, lower back, hips, and thighs working simultaneously or individually. DEEP TISSUE MASSAGE & FULL BODY STRETCHING: Designed to provide detailed, human-like massage throughout the body and the stretching function is also referred to as the "spinal decompression" program. 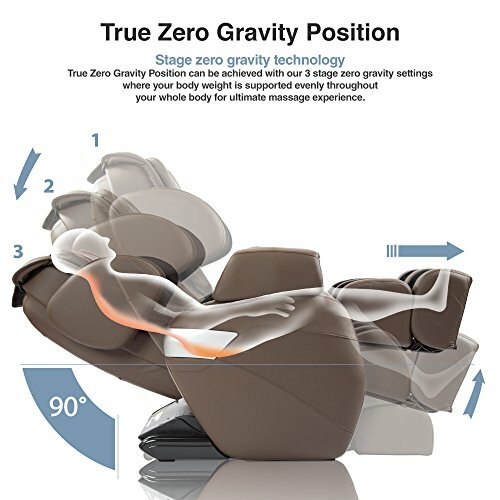 With vigorous air cells pinning your body in place, the chair moves you to a calculated routine, and slowly stretches out the leg and back muscles. 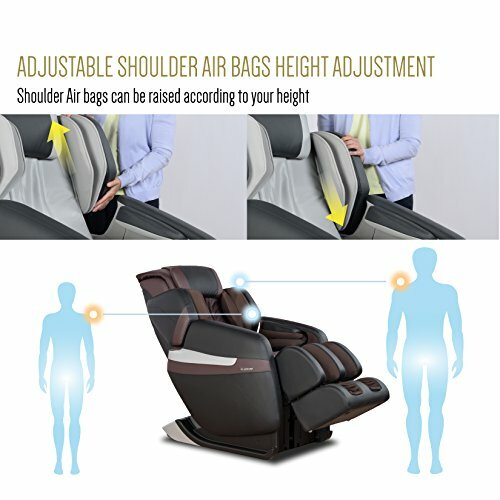 BEAUTY HIP MASSAGER: Multiple Air bag for your hip and your waist line which inflates for compression massage to align lower back and pelvis area. 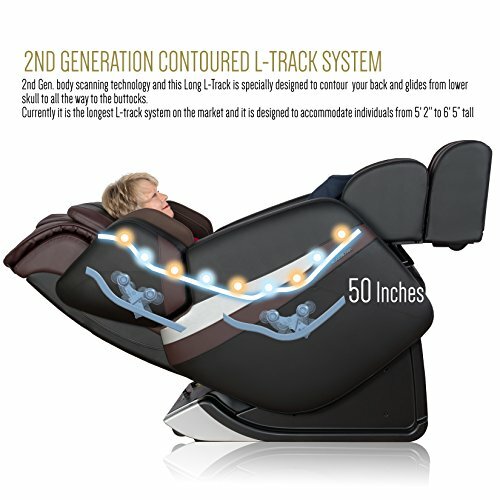 LOWER BACK HEATING: 2 heating pads in lower back area that enhance the massage experience. ARM MASSAGER: Two air bags are carefully located to apply a deep massage to the forearms and wrists. 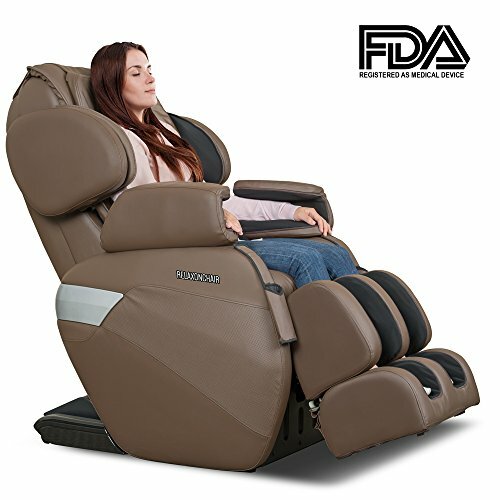 CALF & FOOT MASSAGER: Multiple air bags on sides and back of the legs and feet which inflate for compression massage with bottom spinning roller that apply concentrated pin-point kneading massage. 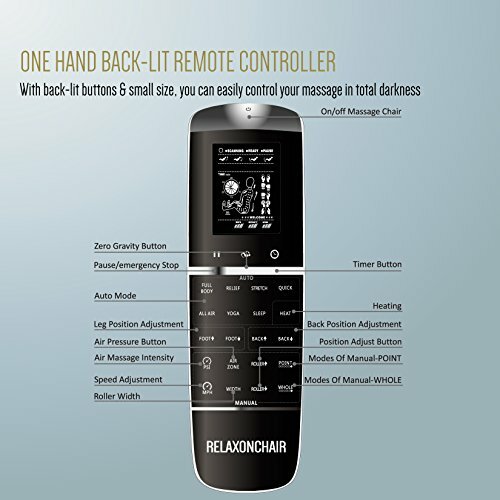 FULL SIZE REMOTE CONTROLLER: Large viewing screen to easily visualize what functions the chair has activated.